The Tesla Coil was tested three separate times during the class, shocking students with it's loud sounds. The last day of the semester posed to be an exciting one, at least for the students of physics teacher Mr.Cardenas in AP Physics C. The final group project didn’t seem to have many rules, they just had to include things they learned during the class. Different student groups did completely different projects, featuring a physics computer game “Cat-apult”, potato electricity, a black hole theory project, and a wave table. Each project had to safely center around a main concept learned in the AP Physics C class, but other than that, the main guideline was to have fun and do something that each student is interested in! 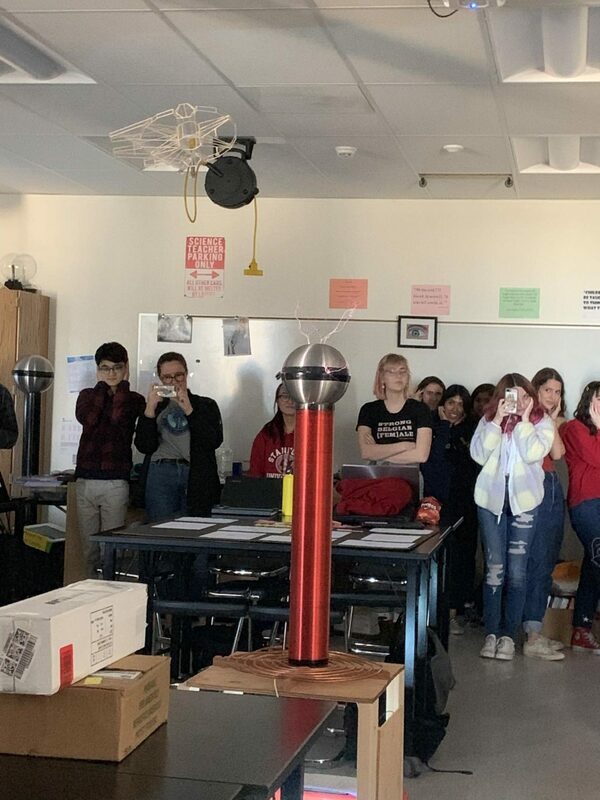 One group of students made a classical Tesla Coil, which was demonstrated three times throughout the period. The Tesla Coil is a resonant transformer circuit that produces high-voltage, low-current, high frequency alternating-current electricity. seniors, David Detweiler, Luke Walker, and Karl Ensberg who designed the coil spent about a month creating it.